Open address in Google Maps! 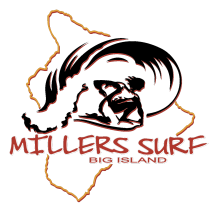 ​Miller's Surf and Sport has been the one-stop-shop for all of your surf, skate, and bodyboard needs for over 17 years - providing quality gear to the Big Island at great prices! Starting out as a simple rental shop, we have grown to what we are today because of people like you. At Miller’s, we are all about the gear, and we have the biggest selection in the area. Whether you need a bodyboard or accessories for your GoPro, we are here to help you find a great deal so that you can get on with your adventure! We take "Aloha" to heart, and we love what we do! With a love for the rich nature Hawaii offers. We find peace when we are outside challenging ourselves and each other, doing what we are most passionate about. That is why we want to provide an easy avenue for you to explore and take part in the diverse culture of the surf and skate community. That is why we obsess over the best gear, we commit to affordable prices, and we test out our products so that we know what to recommend. We love to play hard, and love hearing stories from our customers. Whether you are hitting up Banyans or Pine Trees to surf or skating down to Waikoloa Skatepark, stop by and say Aloha - we will hook you up with the best gear on the Big Island. We are open daily from 8:30 am to 6:00 pm and are located in Kopiko Plaza on Palani Road. Feel free to call us if you have any questions: 808-326-1771.